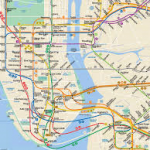 The Friday File: The seventh busiest and fifth longest subway system in the world is the New York City subway which had ridership of 1.7 billion in 2012 and has 368km of track. The busiest is the Tokyo system which served 3.1 billion riders in 2012 and has 310km of track. The longest is Seoul’s subway system, with an amazing 940km of track and which had ridership of 2.5 billion.